A step-by-step guide to writing a web scraper with Python. The course assumes the reader has little experience with Python and the command line, covering a number of fundamental skills that can be applied to other problems. This guide was initially developed by Chase Davis, Jackie Kazil, Sisi Wei and Matt Wynn for bootcamps held by Investigative Reporters and Editors at the University of Missouri in Columbia, Missouri in 2013 and 2014. It was modified by Ben Welsh in December 2014 for workshops at The Centre for Cultura Contemporania de Barcelona, Medialab-Prado and the Escuela de Periodismo y Comunicación at Universidad Rey Juan Carlos. 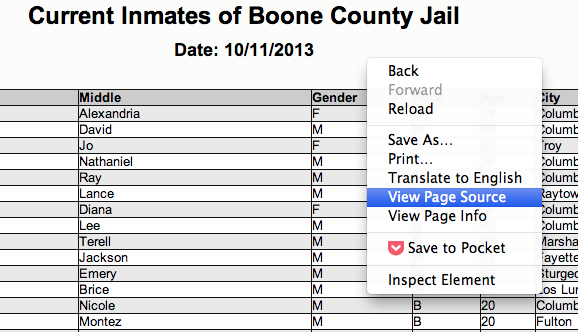 This tutorial will guide you through the process of writing a Python script that can extract the roster of inmates at the Boone County Jail in Missouri from a local government website and save it as comma-delimited text ready for analysis. Before you can begin, your computer needs the following tools installed and working to participate. Depending on your experience and operating system, you might already be ready to go with everything above. If so, move on to the next chapter. If not, don’t worry. And don’t give up! It will be a bit of a slog but the instructions below will point you in the right direction. Unless something is wrong with your computer, there should be a way to open a window that lets you type in commands. Different operating systems give this tool slightly different names, but they all have some form of it, and there are alternative programs you can install as well. On Windows you can find the command-line interface by opening the “command prompt.” Here are instructions for Windows 8 and earlier versions. On Apple computers, you open the “Terminal” application. Ubuntu Linux comes with a program of the same name. A program like Microsoft Word, which can do all sorts of text formatting like change the size and color of words, is not what you need. Do not try to use it below. You need a program that works with simple “plain text” files, and is therefore capable of editing documents containing Python code, HTML markup and other languages without dressing them up by adding anything extra. Such programs are easy to find and some of the best ones are free, including those below. For Windows, I recommend installing Notepad++. For Apple computers, try TextWrangler. In Ubuntu Linux you can stick with the pre-installed gedit text editor. If you are using Mac OSX or a common flavor of Linux, Python is probably already installed and you can test to see what version, if any, is there waiting for you by typing the following into your terminal. You don’t have to type the “$” It’s just a generic symbol geeks use to show they’re working on the command line. If you don’t have Python installed (a more likely fate for Windows users) try downloading and installing it from here. In Windows, it’s also crucial to make sure that the Python program is available on your system’s PATH so it can be called from anywhere on the command line. This screencast can guide you through that process. Python 2.7 is preferred but you can probably find a way to make most of this tutorial work with other versions if you futz a little. The pip package manager makes it easy to install open-source libraries that expand what you’re able to do with Python. Later, we will use it to install everything needed to create a working web application. If you don’t have it already, you can get pip by following these instructions. In Windows, it’s necessary to make sure that the Python Scripts directory is available on your system’s PATH so it can be called from anywhere on the command line. This screencast can help. Verify pip is installed with the following. In this lesson we’ll be using it to give the computer direct commands to manage files, navigate through directories and execute Python scripts. Don’t worry, it’ll only require only a few basic commands we’ll cover now. Open the command-line program for your operating system and let’s get started. If you need help finding it refer to the prequisite instructions for the Command-line interface. You don’t have to type the “$”. It’s a generic symbol geeks use to show they’re working on the command line. The terminal should print out your current location relative to the root of your computer’s filesystem. In this case, you’re probably in the default directory for your user, also known as your home directory. It’s easy to lose track of which folder you’re in when you’re working from the command line, so this is a helpful tool for finding your way. You’ll end up using it a lot more than you might think. In case you’re curious, pwd standards “present working directory” and cd stands for “change directory,” a tool we’ll use again soon to move between folders on your file system. You should now see a list of files and folders appear, such as Downloads, Documents, Desktop, etc. These should look a little familiar. The command line is just another way of navigating the directory structure you’re probably used to seeing when clicking around your computer’s folders in the user-interface provided by your operating system. Now let’s move. In order to change directories from the command line, we’ll return to the cd command we saw earlier, which works for OSX, Linux and Windows. The only thing you need to do is tell it which directory to move into. In this case, the following will probably drop you on your desktop. Now run ls or dir to see what files we can find there. They should mirror what you see as you look at your desktop in your operating system’s user interface. To move back to our home folder, we’ll use the cd command again, but with a little twist. You’ll notice that will move you back to the home directory where we began. When you’re working from the command line, it helps to think of your directory structure as a tree. Navigating through the directories is like going higher and lower on various branches. The convention for moving backwards is ..
You might also find it useful sometimes to create files and directories from the command line. Let’s create a folder called Code under our home directory that we can use to store code from this class. If you type ls or dir you’ll notice that nothing is there. That’s because all we’ve done so far is create a directory, but we haven’t put any files in it yet. 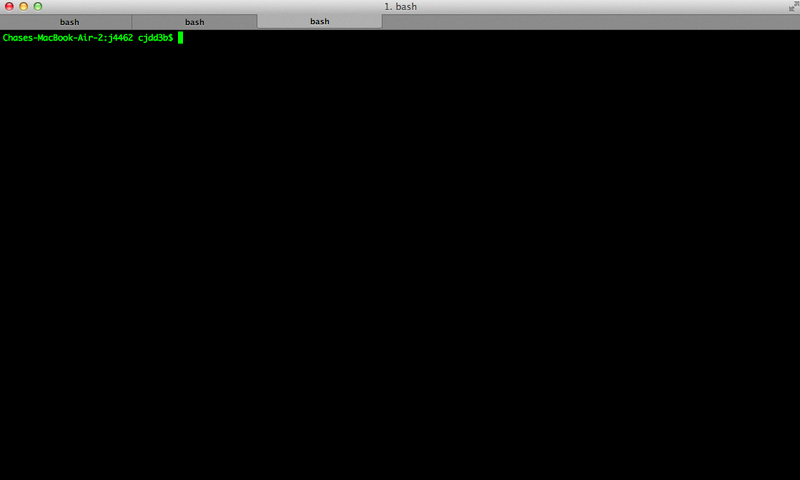 You won’t have to do this very often, but the command for creating a blank file in OSX and Linux is called touch. So here’s how you make a new file named test.py. There’s no similar command in Windows, but you can accomplish the same thing by saving a file from a text editor or other program into our new directory. This must be done with caution. Files you delete from the command line do not go into the recycle bin. They are gone. Forever. And that’s it! You’ve learned all the basic command-line tricks necessary to move on. Python can be used for almost any application you can imagine, from building websites to running robots. A thorough overview of the language would take months, so our class is going to concentrate on the absolute basics – basic principles that you need to understand as you complete this course. That’s it. And it works for both OSX and Windows. Python also comes with a very neat feature called an interactive interpreter, which allows you to execute Python code one line at a time, sort of like working from the command line. We’ll be using this a lot in the beginning to demonstrate concepts, but in the real world it’s often useful for testing and debugging. 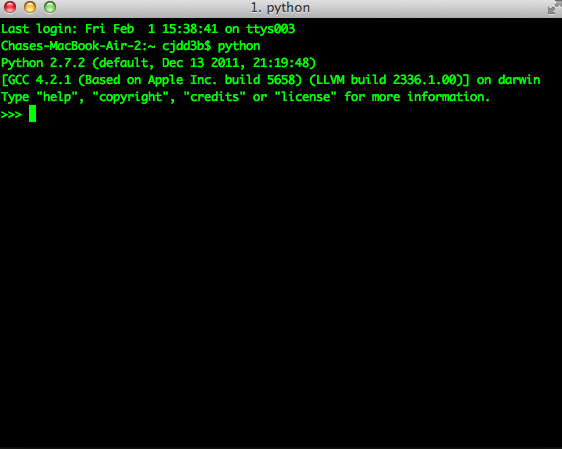 To open the interpreter, simply type python from your command line, like this. And here’s what you should get. Next we’ll use the interpreter to walk through a handful of basic concepts you need to understand if you’re going to be writing code, Python or otherwise. Variables are like containers that hold different types of data so you can go back and refer to them later. They’re fundamental to programming in any language, and you’ll use them all the time. To try them out, open your Python interpreter. Now let’s start writing Python! >>> greeting = "Hello, world!" In this case, we’ve created a variable called greeting and assigned it the string value “Hello, world!”. In Python, variable assignment is done with the = sign. On the left is the name of the variable you want to create (it can be anything) and on the right is the value that you want to assign to that variable. If we use the print command on the variable, Python will output “Hello, world!” to the terminal because that value is stored in the variable. Variables can contain many different kinds of data types. There are integers, strings, floating point numbers (decimals), and other types of data that languages like SQL like to deal with in different ways. Python is no different. In particular, there are six different data types you will be dealing with on a regular basis: strings, integers, floats, lists, tuples and dictionaries. Here’s a little detail on each. >>> goodbye = "Seeya later, dude." Floats are a fancy name for numbers with decimal points in them. They are declared the same way as integers but have some idiosyncracies you don’t need to worry about for now. Lists also have another neat feature: The ability to retrieve individual items. In order to get a specific item out of a list, you just pass in its position. All lists in Python are zero-indexed, which means the first item in them sits at position 0. Tuples are a special type of list that cannot be changed once they are created. That’s not especially important right now. All you need to know is that they are declared with parentheses (). For now, just think of them as lists. Dictionaries are probably the most difficult data type to explain, but also among the most useful. In technical terms, they are storehouses for pairs of keys and values. You can think of them like a phonebook. An example will make this a little more clear. In this example, the keys are the names “Mom” and “Chinese takeout”, which are declared as strings (Python dictionary keys usually are). The values are the phone numbers, which are also strings, although dictionary values in practice can be any data type. There’s a lot more to dictionaries, but that’s all you need to know for now. As a beginner your first Python scripts won’t be much more complicated that a series of commands that execute one after another, working together to accomplish a task. In those situations, it is helpful to be able to control the order and conditions under which those commands will run. That’s where control structures come in – simple logical operators that allow you to execute parts of your code when the right conditions call for it. Here are two you will end up using a lot. If statements are pretty much exactly what they sound like. If a certain condition is met, your program should do something. >>>    print "Wow, that's a big number!" Wow, that's a big number! Our little program in this case starts with a variable, which we’ve called number, being set to 10. That’s pretty simple, and a concept you should be familiar with by this point. The next line, if number > 5: declares our if statement. In this case, we want something to happen if the number variable is greater than 5. Most of the if statements we build are going to rely on equality operators like the kind we learned in elementary school: greater than (>), less than (<), greater than or equal to (>=), less than or equal to (<=) and plain old “equals”. The equals operator is a little tricky, in that it is declared with two equals signs (==), not one (=). Why is that? Because you’ll remember from above that a single equals sign is the notation we use to assign a value to a variable! Next, take note of the indentation. In Python, whitespace matters. A lot. Notice that I said indents must be four spaces. Four spaces means four spaces – not a tab. Tabs and spaces are different. To avoid problems, you should press the space bar four times whenever you indent Python code. There are some text editors that will automatically convert tabs to spaces, and once you feel more comfortable you might want to use one. But for now, get in the habit of making all indents four spaces. If you look closely, there’s another small detail you need to remember: The colon! When we declare an if statement, we always end that line with a colon. >>>     print "Wow, that's a big number!" >>> print "I execute no matter what your number is!" It helps sometimes to think of your program as taking place on different levels. In this case, the first level of our program (the one that isn’t indented) has us declaring the variable number = 10 and setting up our if condition, if number > 5:. The second level of our program executes only on the condition that our if statement is true. Therefore, because it depends on that if statement, it is indented four spaces. I execute no matter what your number is! The last statement doesn’t depend on the if statement, so it will always run. Now let’s talk about a common companion for if statement – the else clause. It can be combined with an if statement to have the script execute a block of code when it turns out not to be true. print "Wow, that's a big number!" print "Gee, that number's kind of small, don't you think?" In this case, we’re telling our program to print one thing if number is greater than five, and something else if it’s not. Notice that the else statement also ends with a colon, and as such its contents are also indented four spaces. Remember earlier we discussed the concept of a list – the type of variable that can hold multiple items in it all at once? Many times during your programming career, you’ll find it helps to run through an entire list of items and do something with all of them, one at a time. The output of this statement is what you might guess. But there are still a few things to unpack here – some familiar and some not. First, you’ll notice from looking at the print statement that our indentation rules still apply. Everything that happens within the for loop must still be indented four spaces from the main level of the program. You’ll also see that the line declaring the loop ends in a colon, just like the if and else statements. Second, turn your attention to the syntax of declaring the loop itself. All of our for loops start, unsurprisingly, with the word for and follow the pattern for variable_name in list:. The variable_name can be anything you want – it’s essentially just a new variable you’re creating to refer to each item within your list as the for loop iterates over it. The next thing you have to specify is the list you want to loop over, in this case list_of_letters. The line ends with a colon, and the next line starts with an indent. And that’s the basics of building a loop! Often it’s helpful to encapsulate a sequence of programming instructions into little tools that can be used over and over again. That’s where functions come in. Think of functions like little boxes. They take input (known as arguments), perform some operations on those arguments, and then return an output. Once you write a function (assuming it works) you don’t need to know what’s inside. You can just feed it an input and expect an output in return. Every function must be declared by the word def, which stands for “define”. That is followed by the name of the function. Like the variable in a ``loop` you can call it anything you want. The name is then followed by a set of parentheses in which you can define the arguments the function should expect. In our example above, we’ve called the only argument``x``. When we feed a value in, like the number 10, a variable by the name of our argument is created within the function. You can name that what you want too. After you finish declaring arguments, you’ll see something familiar –the colon. Just like the if statements and for loops, the next line must be indented four spaces because any code within the function is nested one level deeper than the base level of the program. Most functions return some kind of output. Arguments go in, some processing happens, and something comes out. That’s what the return statement is for. But the idea of arguments and return values are still fundamental in understanding functions, and they will come up more often than not. Lucky for us, Python already has tools filled with functions to do pretty much anything you’d ever want to do with a programming language: everything from navigating the web to scraping and analyzing data to performing mathematical operations to building websites. Some of these are built into a toolbox that comes with the language, known as the standard library. Others have been built by members of the developer community and can be downloaded and installed from the web. There are two ways to import these tools into your scripts. In practice, you’ll use both of these methods. There’s no rule but most Python programmers try to keep things manageable by lining up all import statements at the top of each script. Now that we’ve covered all the fundamentals, it’s time to get to work and write a web scraper. 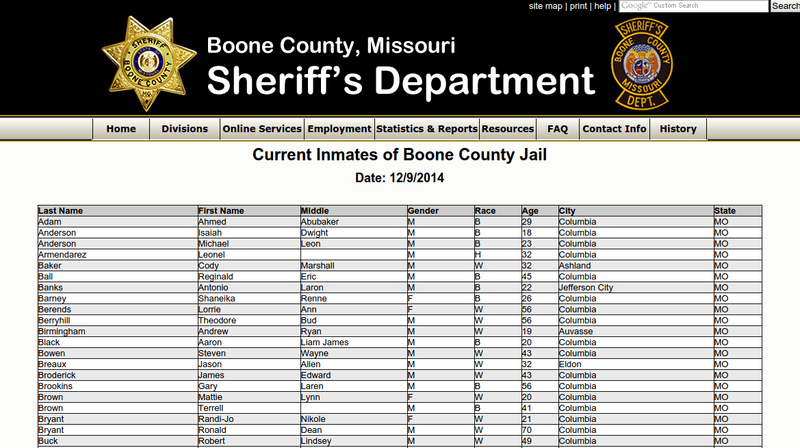 The target is a regularly updated roster of inmates at the Boone County Jail in Missouri. Boone County is home to Columbia, where you can find the University of Missouri’s main campus and the headquarters of Investigative Reporters and Editors. The scraper will use Python’s BeautifulSoup toolkit to parse the site’s HTML and extract the data. We’ll also use the Requests library to open the URL, download the HTML and pass it to BeautifulSoup. Since they are not included in Python’s standard library, we’ll first need to install them using pip, a command-line tool that can grab open-source libraries off the web. If you don’t have it installed, you’ll need to follow the prequisite instructions for pip. On Windows give it a shot with the sudo. But unless you’ve got something fancy on your hands, the data you’re seeking to scrape is usually somewhere within the HTML of the page and your job is to write a script in just the write way to walk through it and pull out the data. In this case, we’ll be looking to extract data from the big table that makes up the heart of the page. By the time we’re finished, we want to have extracted that data, now encrusted in layers of HTML, into a clean spreadsheet. In order to scrape a website, we need to understand how a typical webpage is put together. To view the HTML code that makesup this page () open up a browser and visit out target. Then right click with your mouse and select “View Source.” You can do this for any page on the web. 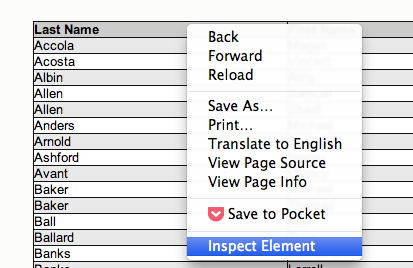 The inspector tool might have a slightly different name depending on which browser you’re using. To make this easy on yourself, consider using Google Chrome. Your browser will open a special panel and highlight the portion of the page’s HTML code that you’ve just clicked on. There are many ways to grab content from HTML, and every page you scrape data from will require a slightly different trick. At this stage, your job is to find a pattern or identifier in the code for the elements you’d like to extract, which we will then give as instructions to our Python code. In the best cases, you can extract content by using the id or class already assigned to the element you’d like to extract. An ‘id’ is intended to act as the unique identifer a specific item on a page. A ‘class’ is used to label a specific type of item on a page. So, there maybe may instances of a class on a page. 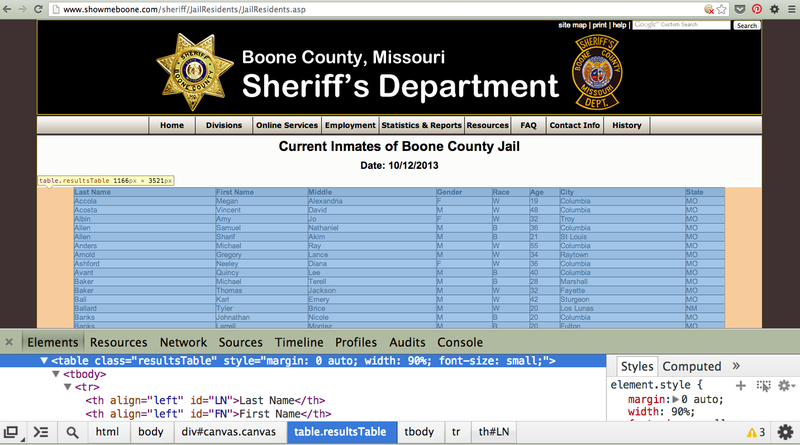 On Boone County’s page, there is only table in the HTML’s body tag. The table is identified by a class. Now that we know where to find the data we’re after, it’s time to write script to pull it down and save it to a comma-delimited file. Let’s start by creating a Python file to hold our scraper. First jump into the Code directory we made at the beginning of this lesson. You’ll need to mkdir Code (or md Code in Windows) if you haven’t made this directory yet. Then open your text editor and save an empty file into the directory name scrape.py and we’re ready to begin. The first step is to import the requests library and download the Boone County webpage. Save the file and run this script from your command line and you should see the entire HTML of the page spilled out. Next import the BeautifulSoup HTML parsing library and feed it the page. Save the file and run the script again and you should see the page’s HTML again, but in a prettier format this time. That’s a hint at the magic happening inside BeautifulSoup once it gets its hands on the page. Next we take all the detective work we did with the page’s HTML above and convert it into a simple, direct command that will instruct BeautifulSoup on how to extract only the table we’re after. Save the file and run scrape.py again. This time it only prints out the table we’re after, which was selected by instructing BeautifulSoup to return only those <table> tags with resultsTable as their class attribute. Now that we have our hands on the table, we need to convert the rows in the table into a list, which we can then loop through and grab all the data out of. BeautifulSoup gets us going by allowing us to dig down into our table and return a list of rows, which are created in HTML using <tr> tags inside the table. Save and run the script. You’ll not see each row printed out separately as the script loops through the table. Next we can loop through each of the cells in each row by select them inside the loop. Cells are created in HTML by the <td> tag. When that prints you will notice some annoying &nbsp; on the end of many lines. That is the HTML code for a non-breaking space, which forces the browser to render an empty space on the page. It is junk and we can delete it easily with this handy Python trick. Save and run the script. Everything should be much better. Now that we have found the data we want to extract, we need to structure it in a way that can be written out to a comma-delimited text file. That won’t be hard since CSVs aren’t any more than a grid of columns and rows, much like a table. Let’s start by adding each cell in a row to a new Python list. Save and rerun the script. Now you should see Python lists streaming by one row at a time. Those lists can now be lumped together into one big list of lists, which, when you think about it, isn’t all that different from how a spreadsheet is structured. Save and rerun the script. You should see a big bunch of data dumped out into the terminal. Look closely and you’ll see the list of lists. To write that list out to a comma-delimited file, we need to import Python’s built-in csv module at the top of the file. Then, at the botton, we will create a new file, hand it off to the csv module, and then lead on a handy tool it has called writerows to dump out our list of lists. Save and run the script. Nothing should happen – at least to appear to happen. Since there are no longer any print statements in the file, the script is no longer dumping data out to your terminal. 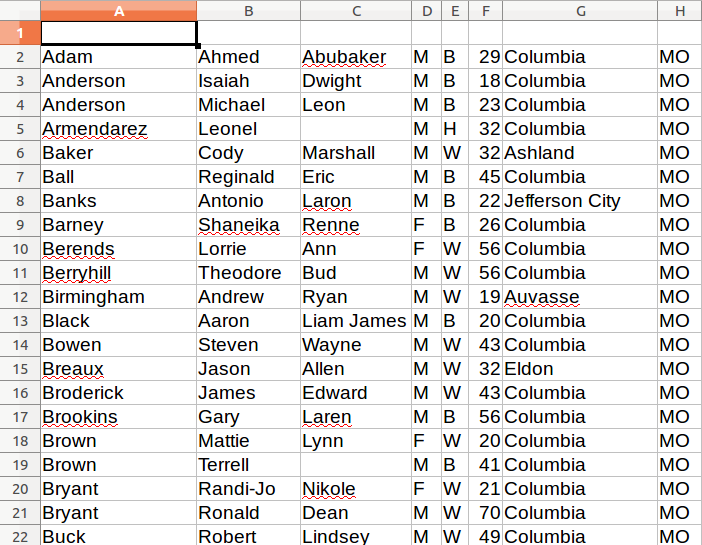 However, if you open up your code directory you should now see a new file named inmates.csv waiting for you. 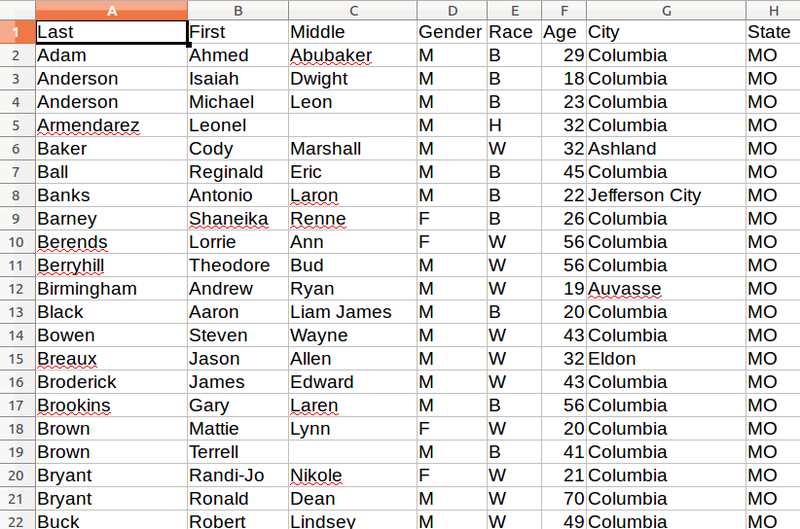 Open it in a text editor or Excel and you should see structured data all scraped out. There is still one obvious problem though. There are no headers! Here’s why. If you go back and look closely, our script is only looping through lists of <td> tags found within each row. Fun fact: Header tags in HTML tables are often wrapped in the slightly different <th> tag. Look back at the source of the Boone County page and you’ll see that’s what exactly they do. But rather than bend over backwords to dig them out of the page, let’s try something a little different. Let’s just skip the first row when we loop though, and then write the headers out ourselves at the end. Save and run the script one last time. Our headers are now there, and you’ve finished the class. Congratulations! You’re now a web scraper. © Copyright 2018. Revision 6ae6b81c.